King Mohammed VI of Morocco took part Sunday at the commemoration of the Centenary of the Armistice Day, marking the end of World War One. 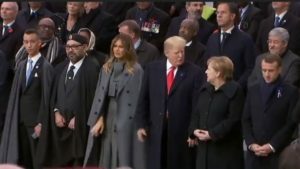 The King, who was accompanied by Crown Prince Moulay El Hassan, was received at the Elysee by French President Emmanuel Macron and his spouse Brigitte before they headed to the Arc de Triomphe square where military parades, several musical interludes, and a speech by President Emmanuel Macron punctuated the first part of the Armistice commemoration ceremonies. King Mohammed VI was seen in the front row of world leaders who came to France to pay tribute to the fallen in the WWI, also known as the Great War. The commemoration is the centerpiece of global tributes to honor the 10 million soldiers who were killed during the 1914-18 war and the moment the Armistice, signed in northeastern France, came into effect at 11 a.m. on Nov. 11, 1918. After the Arc de Triomphe ceremony, the attending seventy heads of state were guest to a luncheon hosted in their honor at the Elysée by President Macron. The Moroccan Sovereign’s participation in the Armistice commemoration symbolizes the friendship that has been binding Morocco and France for centuries, and is a tribute to the valiant Moroccan soldiers who had fought for the ideals of freedom and peace during World War I. Likewise, the Sovereign’s participation sends a strong message to the international community about Morocco’s commitment to world peace and stability and its tireless efforts to promote multilateralism and defense of the universal values of democracy, freedom and equality. In the early afternoon, the Sovereign and other attending Heads of state will join the thousand participants in the Paris Peace Forum, organized part of the Armistice centenary commemoration. The Forum, designed as a response to the rising tensions marking the contemporary world, aims to be a showcase of all the cooperative advances in the fields of peace and security, environment, development, new technologies and inclusive economy. It brings together project leaders from around the world, political and economic leaders, all the actors of civil society (companies, NGOs, foundations, think tanks, media, unions, religious representatives, philanthropists, experts…) and all stakeholders in global governance.